I created a sample Player Unit Record Sheet that you can download, print and use. This is the exact player unit record sheet that I used for the demo game I ran on my “In the Game Room” show. The forces are almost perfectly balanced so that neither side has an advantage. Just roll for CP ratings and then create Fire Priority ratings and start playing. 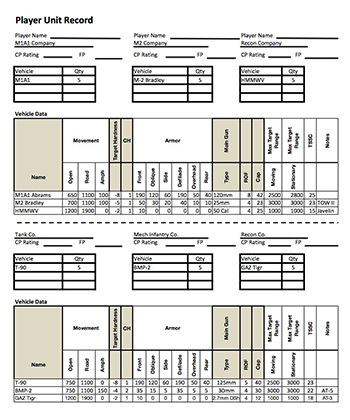 The sample Player Unit Record can be found on the Data Sheets and Rules page. I’m starting to add links on the Vehicle Data Card page for people that want to play TAC II with GHQ Micro Armor in 1/285th scale (6mm). You’ll start to notice to the right of each card link is some text in brackets that starts out – (GHQ ….) This tells you the GHQ part number for the vehicle listed. You can order these vehicles directly from GHQ, pick them up at your local hobby shop, or click on the link and it will take you to that product on the GameCraft Miniatures website. I am working on expanding the data for determining CP (Combat Proficiency) ratings for forces when generating a scenario. When TACFORCE was written they came up with a good system that that used the randomness of the die roll but modified the rolls based on predetermined modifiers. These modifiers took into account the force’s training level, professionalism, experience, leadership, general moral, etc …. basically the die roll was modified by a “bad-assness” factor. For example a third line Warsaw Pack army would have a modifier of 1 and a US Army Delta Force unit might have a modifier of 5 or 6. 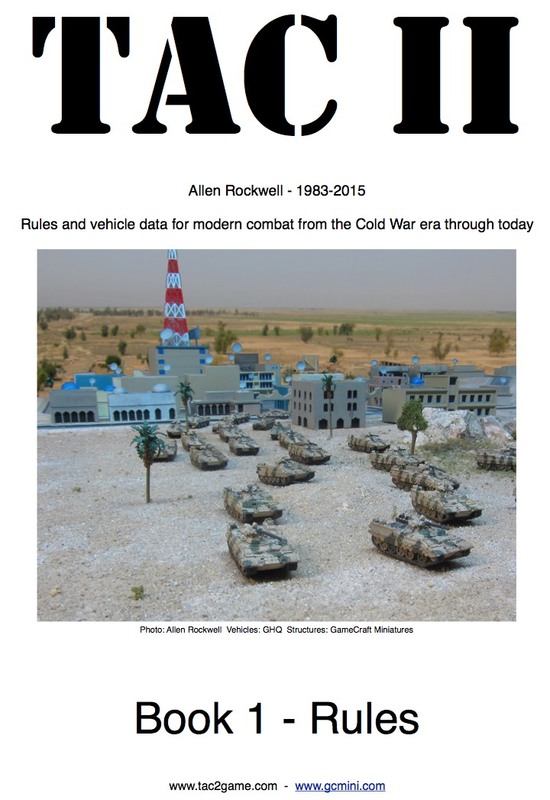 When TACFORCE was published, they created CP die roll modifiers for US and Warsaw Pact units only. My goal is to expand this to cover many, many more countries. So if you have a lot of knowledge about various military forces around the word and want to help, I would appreciate it. I have attached an Excel spreadsheet that lists about 50 different forces from 31 different countries. If you would like to help me out with this project, download the spreadsheet and then in the left hand column you will see a space for rating, enter a score between 1 and 10 in that column rating each force in general bad-assness. For example a local Iraqi insurgent force might have a score of 1 or 2, and an IDF Special Forces Unit or US Delta Force Unit might be somewhere in the area of 10. I know a lot of the scores will be in the area of 5 (that would be normal) with a few down around 1-3 and a few up as high as 8-10,,, that’s fine, I just want your opinion as to the better trained, more disciplined, and more combat ready forces. DO NOT take into account quality of weapons, firepower, etc …. just things like training, professionalism, proficiency, general moral, and overall combat readiness. Think about who you would most want to face in a battle (if you had to) and give them a 1, then think about who you would least like to face in a battle and give them a 10 ,, then fill in all the ones in between. Click the link below (Right-Click and “Save As…”) to download the file. The file is MS Excel format, created on a Mac, so don’t worry about viruses. Yesterday I sent the TAC II Rulebook (Book 1) to two book printing companies to get a sample of a professionally printed and bound copy of the book from each of them. If I’m satisfied with the results from either of them (and when I’m totally done editing the book), I’ll order a bunch of copies and make them available to you at the cost of printing. Everything I’ve created for TAC II was and is meant to be available for free to anyone that wants it, and that will not change. If I decide to pursue these professionally printed and bound copies I will still make the PDF version of the book available for free, just like always. This will just be an option for people that want to have nicely printed and bound version. You’ll still be able to download the PDF for free and print it yourself. The TAC II site has been a “forum” site for the last few years. I thought this would be the best way to provide this information to the people that wanted it and to encourage interaction between myself and the users of TAC II. Sadly the forums software I was using was really not very good and keeping the site updated and interacting with the users was not very easy or intuitive … so as a result I rarely ever visited the site myself. Moving the site to a blogging platform (WordPress) should make a huge difference in both content management and interaction with the users. Please feel free to leave comments on any posts on this site and stay engaged with the TAC II family. Use the “Data Sheets and Rules” and “Vehicle Cards” links above to get the latest weapons and vehicle data and TACFORCE style cards.